Just a few decades ago, Korean households started winter with mothers’kimchi-making. Making kimchi for winter was an annual event for a family, which took much effort. However, mothers made kimchi with love because it was food for her family during the whole winter. They also shared the kimchi that they made with their neighbors. In winter season, the warmth of love is needed the most. So, at the beginning of winter, the IWF held the “2009 Kimchi-Making Event for Sharing Mother’s Love With Neighbors in Need.” On a mild day, November 11, about 150 volunteers gathered to make kimchi: IWF Chairwoman Zahng Gil-jah,IWF board members, Vocalists Yun Tae-gyu and Baek Mi-hyeon and about 30 family members of American diplomats in Korea, as well as the IWF members from Seong-nam and OK-cheon areas. Families of American diplomats in Korea participate in the event. Kimchi made with the love of a mother wins the taste of the world. Five tons of salted Korean cabbages already arrived at event place; they will become the main side dish throughout winter for 500 unprivileged families. From a few days before the event, the IWF members salted cabbages and prepared spices, wishing their neighbors to go through this winter healthy; the IWF members themselves pulled out cabbages in the field, trimmed, salted, washed and drained them. The spices were made of fresh local farm products. 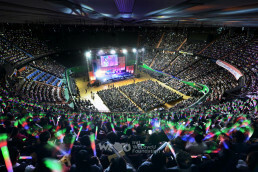 Vocalist Yun Tae-gyu enjoys making kimchi despite his busy schedule. Foreign tourists, who visited the Namsan Korean House Village, stopped to see this unusual event and kept pressing the shutter. Some tourists carefully read the exhibit on kimchi, and some tasted kimchi or joined to make it. The event finished after a couple of hours thanks to the unity of the volunteers, and 500 boxes of kimchi piled up. 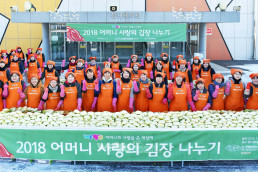 450 boxes of kimchi were distributed to the neighbors in need from 2 p.m. through the officials in Jung-gu, Junglang-gu and Nowon-gu offices in Seoul. 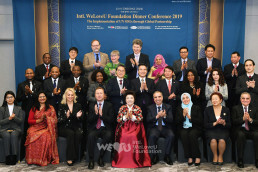 Chairwoman Zahng Gil-jah expressed her thanks to the IWF members and foreign participants one by one. After the event, she visited some grandparent-grandchildren households in Wolgye 2-dong, Nowon-gu, Seoul, and delivered kimchi, rice and food gift set in person. Senior citizens were happy to see their grandchildren welcoming the guests and exited at the food gift sets: they thankde the IWF members. Chairwoman Zahng Gil-jah comforted senior citizens for their hardship and pain and wished them good health, and also asked their grandchildren to take care of their grandparents and grow bright. Kimchi-making festival with foreigners to share a mother’s love: Chairwoman Zahng Gil-jah (third from left), and Vocalist Baek Mi-hyeon (fourth from left).